So there I was, strolling through the outdoor sports section at Walmart like I do every time I visit that store, when I noticed something interesting on the tents shelf. There was something that they called ConnecTents. The tents are marketed under Walmart’s Ozark Trail brand. What is interesting is that these are designed as accessories to your accordion-frame canopy. They cannot free-stand – they must be attached to a standing canopy. 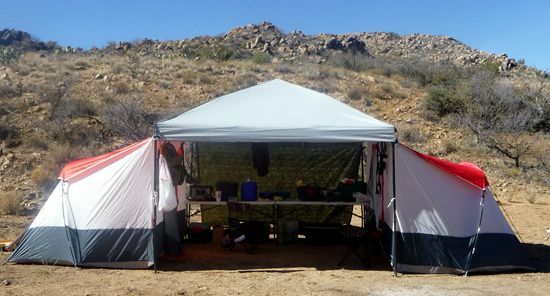 Back in November of 2011, I wrote a little story about the “The Walmart Outfitter Tent,” which is nothing more than one of these canopies fitted with the solid nylon windbreak walls, used as a large 10’x10’ tent. Yeah, these canopies are a very useful piece of kit for camping. There are a couple of different versions of the Ozark Trail ConnecTents. There is a version that hangs from the center of the canopy, basically taking over the entire canopy in the fashion of my “Outfitter Tent”. That one is called the 6-person ConnecTent. 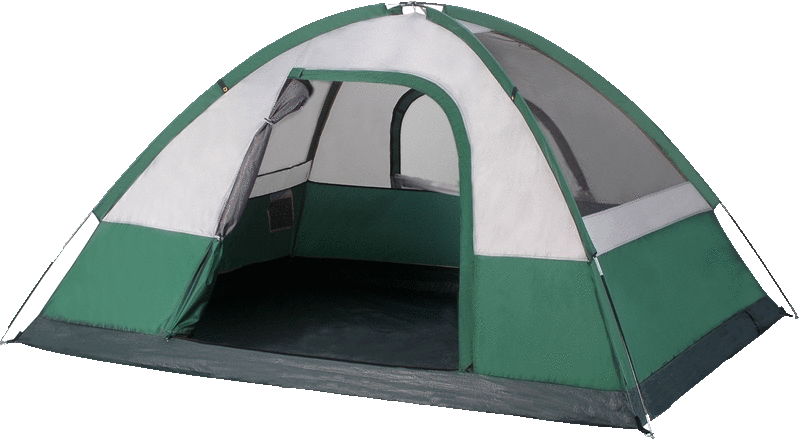 Then there are a couple other options that do not use the accordion-frame canopy, but allow several tents to be connected together in various ways in a modular fashion. The version that I got and will be the focus of this gear review is the 4-person ConnecTent. These ConnecTents are designed to be used with just about any 10’x10’ straight leg (not slanted leg) canopy. They will also work with a 12’x12’ canopy, but you will need to buy some separate extension lines for that to work. I purchased two 4-person ConnecTents to mount on opposite sides of the canopy. I had a javelina hunt coming up with my son Bennet, and I had already decided not to take my pop-up camping trailer. We were only going for three nights, we needed to tow-in the Polaris hunting buggy, and the road in was 15 miles of washboarded dirt. Whenever I take the camping trailer on an extended drive down a bumpy road, I need to spend some time screwing the cabinets back together upon arrival! So when I saw these on the store shelf, it seemed like a great option for the hunt. Each tent was about $40. Each tent is 4-person if you lay 4 sleeping bags shoulder-to shoulder across the floor. My intent was for each of us to use one of the tents with a cot aligned along the 10 foot side of the canopy towards the back wall of the tent. That gives one person all the room they need to spread out with duffel, boots, and a little camping table next to the cot as a nightstand. There is a D-ring above the back window which we used to hang a USB light bulb powered by a USB battery pack which slides into a little storage pouch at the bottom of the window. That worked fantastic to light the tents at night, making for quite a cozy little camping space. 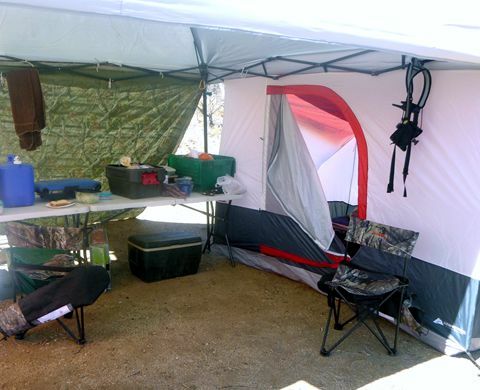 With a tarp staked down at the back, and two 5-foot folding camping tables, we had a nicely shaded kitchen and hang-out area conveniently located between the two tents. Each ConnecTent erects by first attaching to the canopy, then pulling the tent back and staking it out. Each tent needs just one arched pole to stand it up. There is a large D-shaped door facing into the canopy with one arched window opposite on the back wall. The roof is mesh with a built-in fly on the outside which can be rolled up if desired to give a sky view. I was pretty impressed with this setup for those times when pulling in the camping trailer might not be the best option for a trip into the back woods.